All In One Desktop Computer PC Touch Screen, TV,Wi-fi,bluetooth,webcam is optional low power consumption Christmas Promotion Item RAM/HDD/CPU can be upgradable LCD Specifications Panel Size	15.4inch-65inch Aspect Ratio	4:3/16:9 Max Resolution	1024*768 / 1920 * 1080P(Full HD) Color	16.7M Brightness	600cd/m2 Contrast Ratio	1000 : 1 Response Time	8ms Panel life	Above 50000hours Computer Configuration CPU	Intel Atom D525 Dual Core 1.8GHz or Core i3 Chipset	Intel NM10 or Intel H55 chipset RAM	2GB DDR3 RAM (Up to 4GB) Graphics	Intel GMA3150 graphics controller Audio	RealtekHDAudio Integrated 6 sound track Network Interface Card	10/100/1000 Mbits/sec Ethernet LAN connectivity WiFi	150Mbps/802.11a/b/g/n included H.D.D. 3.5 inch 320GB SATA HDD/7200rpm up to 1TB Speak	2 build-in high quality stereo speaks(2*10w) O.D.D	DVD-RW(Optional) Mouse/Keyboard	Wireless Pre-Installed OS	Windows XP/Win7(copy version for free) TV Tunner	Optional TV Function Remote controller	Available OSD language	Chinese/English/French/German/Italian/Spanish Input/Output Interfaces	HDMIx1, VGAx1, AVx3, YPBPRx1, Audio-inx1, Audio-outx1 Color System	PAL/NTSC/SECAM Product Features: 1. Adopt A grade 335 standard full new and original factory packing screen. 2. High-class plastic material frame, the color can be customized. 3. Ultrathin, highlight, perfectly clear tempered glass on the surface of the LCD screen to protect the screen being damaged. 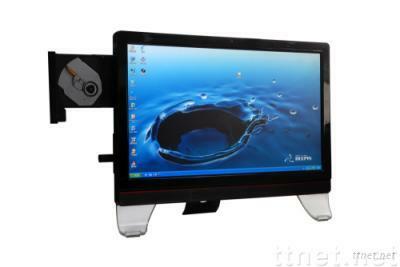 4.single-point or dual-point touch screen can be customized. Applicable Fields Business Organizations: supermarket, shopping malls, exclusive agency, chain shops, large-scale sales, hotels, restaurants, travel agencies etc. Financial Organizations: Banks, negotiable securities, funds, insurance companies, pawnshops; Non-profit Organizations: Telecommunications, post offices, hospital, schools; Public Places: subway, airports, stations, gas stations, toll stations, bookstores, parks, exhibition halls, stadiums, museums, convention centers, ticket agencies, HR market, lottery centers; Real Estate Property: Apartments, offices, commercial buildings, model rooms, property brokers; Entertainments: Movie theaters, fitness halls, clubs, massage rooms, bars, cafes, Internet bars, beauty shops, golf course.